After a long and complicated struggle to officialize a girls’ lacrosse team at Carmel High, CHS students and parents have finally succeeded, but now the question stands: Will this newfound team bring victory and success for themselves, or is the team not prepared for what’s to come? It has been said in the past by Carmel High athletic director Golden Anderson that the only reason for there not being a particular sports team on campus is because of a lack of interest, an aspect needed in order to form any team, but that was not the case for girls’ lacrosse. “Mary Rice went through a very long process to try and get the team up and running, and due to her persistence and support, it all really paid off,” junior Olivia Myers says. Rice, mother of team member Lauren Rice, met with the athletic director in order to determine the amount of commitment and interest in the sport from the girls at CHS and worked to evaluate the depth of the team, meaning that there was diversity among the girls and not solely seniors interested in playing. After looking at all aspects of the situation and making sure this team would not interfere with any other CHS spring sports, the team was approved. “It was an interesting process, but over 30 girls have joined, and a dozen more were willing to join, but could not due to prior obligation, so it was worth it,” Mary Rice says. After witnessing the immense passion coming from girls who were willing to play lacrosse, as well as from some hard-working padre parents, the optimism of the new team began to grow. 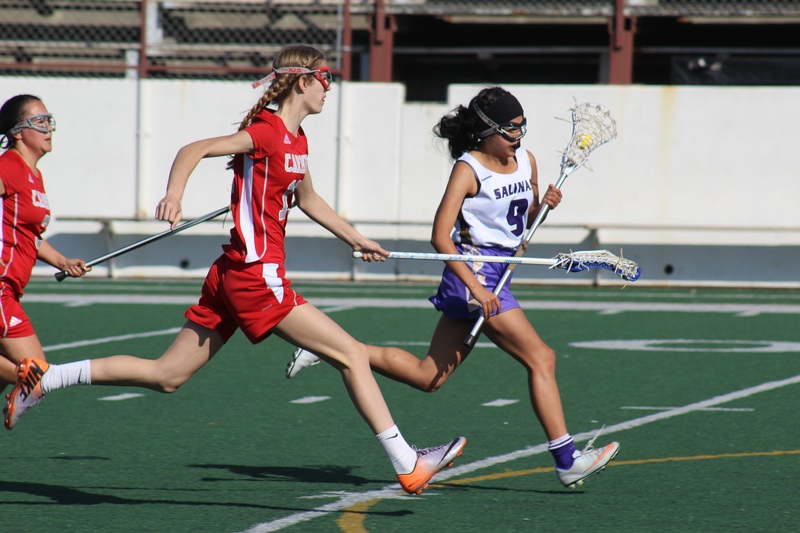 The girls’ first game ended with a 13-6 defeat to Salinas on March 30, with the first goal ever being scored by freshman Lauren Rice, following with a goal by freshman Karoline Ruiz, and goals from all three captains: junior Jessica Purdom and seniors Raven Gabrielson and Kaley Kinoshita. Despite their loss, the team had a good time, with this their first time on the field all together. Neither the girls, nor the athletic department is taking this first loss personally. The girls have definitely proved their willingness and devotion to the sport as a whole—the team itself is living proof—but many of the girls are inexperienced, which leaves some speculation for an unsuccessful season to follow. “We do not all know how to play, but I hope that we can all learn how and get a basic understanding of the game so that we may be able to win more games in the future,” sophomore Serena Valdez Klemek says. Despite their lack of experience, many of the girls are eager to learn, giving them an immediate advantage, and there are currently many players on the team, which could contain fresh, undiscovered talent waiting to be found from a diverse bunch. Instead of holding traditional tryouts like most other sports at CHS, the lacrosse team accepted anyone and everyone who wanted to play. “There were no tryouts because this is a new program intended to gain an interest for the game,” sophomore Aminah Khalil adds. This means that there are now 29 girls on the team, massive growth from their starting point of 17 girls, surprising considering the lack of exposure to lacrosse for girls. Lacrosse is not a conventional sport, such as perhaps Little League Baseball, Anderson mentions, and the idea of learning something new and developing more adequate skills is something which has intrigued many CHS girls. They are learning under the leadership of CHS graduate Brian Jasper, a four-year player under the boys’ lacrosse program, who left his position playing college lacrosse after some unfortunate injuries. He stepped up from coaching the CHS junior varsity boys, as well as at the Tribe level—a youth league lacrosse—to throw his hat in the ring for the girls and take on their team. Although Jasper will have his hands full with teaching new players the ways of the game, there is already some experienced talent on the team, girls who are prepared for the events of the season to come. “I played Tribe lacrosse fifth through seventh grade and last year when there wasn’t a team, I played for the Underdogs for a couple games and a tournament,” says Lauren Rice, an experienced lacrosse player. Since other girls have had prior experience with the game, they were ready to lead their teammates throughout the season, despite their bittersweet loss against Salinas. Carmel will have several opportunities to redeem themselves. The team was scheduled for an away game against York on Wednesday, and the girls’ next game is on April 19 at Stevenson.